I am in the process of fitting a Massoth xl into an old Uintah Mallet. It only has the raised 'D' on the bogies. Attached is the photograph showing where I've got to (and the old circuit board to one side that the xl replaced). So far the interior, firebox and forward lights work, the engine moves backwards and forwards and the sound effect of the engine in motion works too. What I can't make work, when it's running on the track, are the rest of the sounds effects. eg, whistle, bell, long whistle. I've looked at the instruction manual for the loco and press the appropriate buttons on my handset, but nothing works. The whistle does sound when the loco goes over an in-track magnet (I've assumed that this old loco does have the additional sounds effects). Is any one able to look at the photo and give me a steer as to which others wires I need to connect into the xl will make the extra sounds available? Incidentally, when the loco is on the track, the sounds only function when it is moving, there's no sound when it's at rest. Could it be something to do with serial/parallel commands? The XL is a driving decoder. It has no facilities for sound. The sounds you are getting are from the old/original analogue board which presumably is picking up from the power feed to the motors from the XL. Output to control a modern sound board are via a SUSI connection which your XL does not seem to have - it is an older XL, the newer ones are blue not green. Did this loco have standing sounds on DC, before you fitted the XL? I'll go have a look at an XL. It looks like you are feeding power to the old board, from decoder +ve and a function output on the XL? - Presumably, so you can turn off sound? You are getting 'chuff' as it appears to have a wheel sensor? There is no way for commands to get to the old board.. The board needs track-power, not DC, if the commands are to get to it. - You may well also need to turn on serial commands in the XL. I think Dave may have hit the nail on the head. This older loco may be expecting serial commands. The XL will output parallel. You could try adding 1 to what ever value you have in CV49. Very possible Phil. The red wires. We assume they are the power feed to the sound unit Orgiva. If that is so, try connecting them to the track connections (grey and brown wires) - then the old sound board will have full time power. I am still confused regarding sounds though - This was originally an analog loco so I doubt the sound unit would be DCC compatible. So, what sounds did this loco have before the XL was fitted? If analogue only, it would have 'random' sounds, plus chuff in motion.. Whistle and bell from reeds and track magnets.. If it is only analogue, the reeds will still fire sounds on the track. You would have to parallel-up the reed inputs, and function outputs from the XL to 'fire' bell and whistle from DCC. Exactly Phil - I suspect that is the extent of the original sounds. Wow, fantastic response, many thanks. To answer some of the questions. I've tried it on series and parallel but no difference. But now see that I need to turn on 'serial commands' on the decoder itself. Interesting about the colour of the decoder, this one was purchased two weeks ago from Garden Railway Specialists (I hope they didn't offload old stock on me). Also, understood regarding putting the red wires into same slots as the track feed wires in order to ensure full time power. As for the sounds when it was running analogue, it had the chuff, whistle (activated by in track magnet) and a sort of hammering sound. As I said initially I've assumed it had the other sounds but as it is so old it may be limited to those three only. I'll have a go at the suggestions and report back. My CV49 value is 19. I think that means I have Bit 0 'on', meaning the decoder is working on 'serial and parallel data transfer'. There's no 'serial only' setting. Connecting the red wires to the grey and brown wires from the motors did give me permanent sound - thank you for that. For a start you did connect the track and the motor to the decoder. You will need a lgb 55026 interface cable, also available from Massoth. Connections are listed in the Massoth XL manual. - is the sound circuit board (MTS) P(arallel) updated: black/white P sticker on the rear side? - if not: you can only acces the PCB in serial mode. I will have to look up the CV’ s for this combination. As advised, I've now connected the main circuit board to the brown and grey wire feeds from the motors; this gives me permanent sound. There is no place for a 55026 cable to connect to, the receiver end of that cable does not exist on the circuit board. It's not an updated sound board, there's no sticker on the underside, only raised 'D's on the bottom of the bogies. My only question now is whether there are actually any other sounds, apart from the 3 basic ones listed above. At the picture I don’t see a six pin socket anywhere for the 55026 interface cable. If there is, there should also be a round sticker on the bogies with the six white dots in it. If there isn’t a six pin socket, your sound board isn’t digital compatible. There should also be a row of dipswitches to set the board in digital mode. The four dipswithes on the sound board are for analogue sound settings. For the aviailable analogue sounds you should consult the manual. The D on the bogies only indicates that the bogies are digital compatible with four connnectors where the track power is separated from the motor connection. So it may be best to get the decoder back to your dealer and demand a recent blue pcb version and upgrade it to a XLS sound decoder. In that case you can remove all the circuit boards and have the XLS benefits of more functions and more sounds. Wilco, many thanks for your suggestions. From what you say, it's now clear to me that it is not a digital sound board. I always thought that when a decoder was fitted that the dip switches had to be set to off, which is what I've done. Are you suggesting that I switch them back on to access any extra sounds whilst running with the XL? Maybe your manual can help you on the function of those dipswitches. According to the manual of the newer version, one of them was for enabeling digital use. I don’t know if that is the case with your version. To get sounds on the old LGB mikados , you had to hit the F1 key 1 at 1 second intervals to make the sounds occur. to turn sound off you depressed F1 8 times at 0ne second intervals. Yep, that’s MTS serial operation. In your case there is most likely a connection between the decoder and the sound board. It all depends on if the circuit board can work on digital commands. There isn’t any connection to the decoder, so the sound board needs to get the comand elsewhere, maybe directly fom the track. The Massoth decoder can do MTS serial commands and so does the Massoth navigator. It all depends on the sound board. There should be a note in the manual about that. If not, you can’t command the sound board in a digital mode. View attachment 250745 Incidentally, when the loco is on the track, the sounds only function when it is moving, there's no sound when it's at rest. 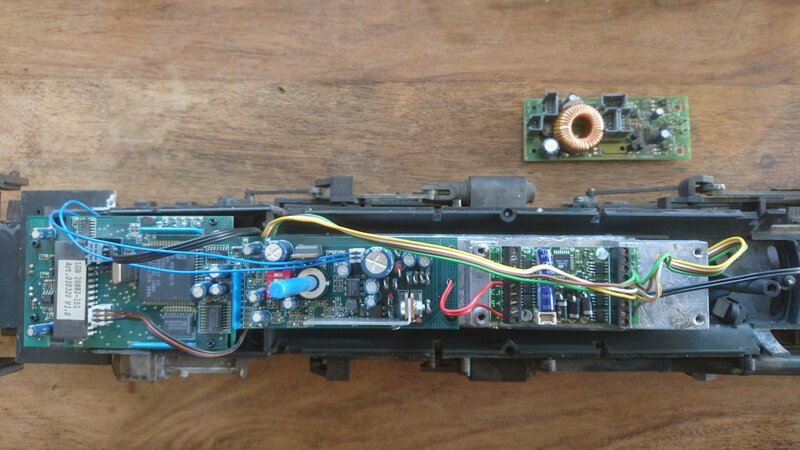 The other option for DCC Power/Sound conversion is to completely remove all electronic components from the locomotive and replace it with a DCC Power/Sound Decoder, such as Massoth, ESU, Zimo, etc. Tom, thank you for your advice. We've established that it is not DCC ready, sadly. I've compared photos of my soundboard/circuit board and those from a 20882 and they are different. This loco must be pre 2000, and certainly pre LGB making the main circuit board DCC ready. Your final suggestion would be the way to go to get a full array of sounds but having invested in the xl, and having achieved permanent sound, I'm going to leave it at that for the moment.